I've been fascinated with pronghorn ever since seeing them in nature documentaries as a child. I think that they are so remarkably beautiful, and its amazing to see them running so fast. While in California, I had learned that there were a few populations of pronghorn in the state (some remaining naturally and some introduced) and we had taken a road trip to Carrizo Plain National Monument with the hope of finding and photographing some. We did see pronghorn, but it was always at too far of a distance for good photographs. Having missed out on that opportunity before, I was really excited to have another chance to photograph one of my childhood favorites in Yellowstone National Park in September. Since I had read that they can be skittish, I wasn't sure what opportunities I would have to photograph pronghorn in the park. Much to my delight, we saw a small herd of around 8 animals right near the Gardiner entrance every day as we drove in and out of the park. It was so much fun to be able to pull the car over and watch them for an extended period of time, and it was great to have so many opportunities to see them up close. One of the members of the herd was this young pronghorn, and it was especially cute as it bounded around the group with the unbridled enthusiasm of a young animal. 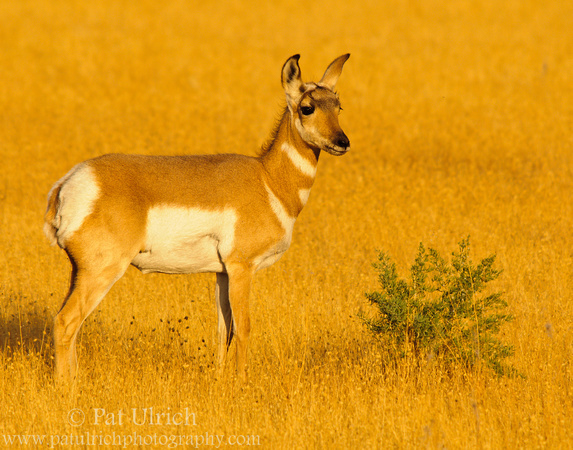 View more photos of Antilocapra americana in my Pronghorn Gallery. a gorgeous shot. such beautiful color! Oh! Look at his little neck hairs! It's looks like either a miniature fauxhawk, or a really bad cowlick. Great composition as always, Pat. Wow! A golden shot in every way! They really are such beautiful creatures. Exceptional image! Amazing shot with fantastic colours. You've done it again Pat. Great colour, great composition, great photo!!! I, too, love pronghorn and Yellowstone National park! I lived in Idaho for 2 years back in the 1980's and would see these on my way to the grocery store! Now that's the way to live! I so miss the Rocky Mountain west! Lovely lighting on this young one! I tell ya I've been to the area 3x and it never gets old. Something about it just always feels like home. Awesome light. Don't know if you could have asked for a better moment!